Discrimination (acrylic on canvas) 36" x 24"
Discrimination is treatment or consideration of, or making a distinction in favor of or against, a person based on the group, class, or category to which that person or thing is perceived to belong to rather than on individual merit. Our country has a long history of discriminatory practices, perhaps the greatest of which was that of Native Americans who had their lands taken from them by European settlers, and then thought of us savages by those who stole their land because they fought back to retain their lands. During the 19th century immigrants from many countries were looked down on by people who had settled here only a generation or two before them. Among the groups hated most were the Irish, Italian, Chinese, Mexicans and Jews. Slavery was perhaps the most flagrant of discriminatory practices, and black America was subject to the most vicious of its cruelties. Though slavery ended in 1865, the battle for equal rights and equal justice continues to this day. People are discriminated do to age, religion, color, poverty and social background. As with the Syrian refuges, people are still afraid of the unknown, and often mistake the enemy by his or her clothing, skin tone or religious practices. 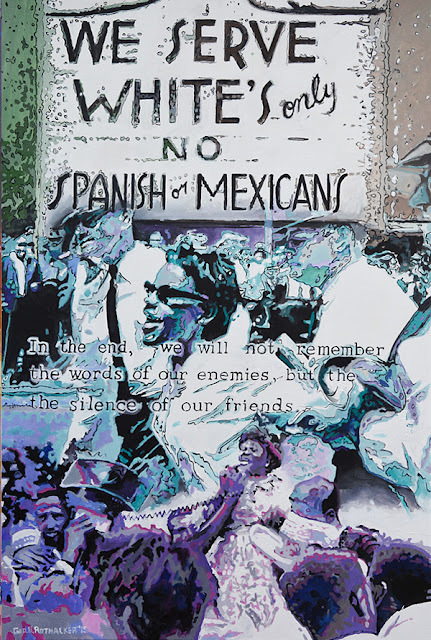 In my painting, I parallel the injustices of black America with a Texas posting that disallows Spanish and Mexicans because they are not "white." 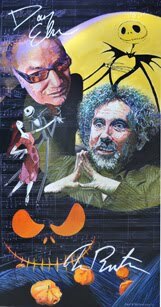 Click Here for other series of paintings by George H. Rothacker. Prints are available on GeorgeRothacker.com. For other info including print and painting prices, call 610-566-0334.